The man who created Mario says he would like to focus more on smaller titles. Super Mario 3D World producer Shigeru Miyamoto is also the man who created Mario in the first place, and has been pretty closely involved with every major Mario title to date. However, it looks like he's ready to take a break from being at the helm, telling Gamekult that there is 'little chance' of him working on the next series installment. He says that he would rather instead turn his focus to smaller titles. "Creating a game of the caliber of Super Mario 3D World takes a lot of energy, and there is little chance that I could take the time to work on the next Mario," Miyamoto said. "However, I want to get involved again and more deeply in the development of smaller projects, but that doesn't mean it will be a modest download-only title or something like that." 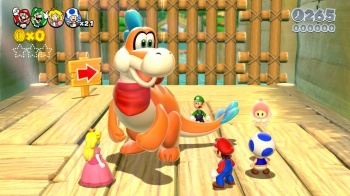 He went on to assure fans that the red-hatted plumber was in good hands, saying "It is not impossible for me to work on a new game as the main producer in the future, but even when I'm not directly in charge of a project, I always look at what the teams does in terms of gameplay, and I trust them. Don't worry about Mario!" We all know that some fantastic (and some... not so fantastic) things can happen when Miyamoto is allowed to let his imagination run wild with smaller projects, so here's hoping that this leads to the fresh, new IP that the Wii U desperately needs.